Support Groups Meeting this Week! Do you live in Texas? In the cities of Amarillo or Houston? There are two Christian Infertility Support Groups meeting this week! For women struggling with infertility or miscarriage. Meets Wednesdays beginning September 1st, tonight at 6:30pm, in Room 402. We will be reading and discussing the book Hannah’s Hope by Jennifer Saake. Contact leader, Valerie Noggle for more info. 6100 Soncy, Amarillo, Tx., 806-457-4900. H.O.P.E. ~ Hearts Of Promise & Expectation for Women meeting Thursday, September 2nd, 7pm in the New Beginnings Room, 2nd floor. 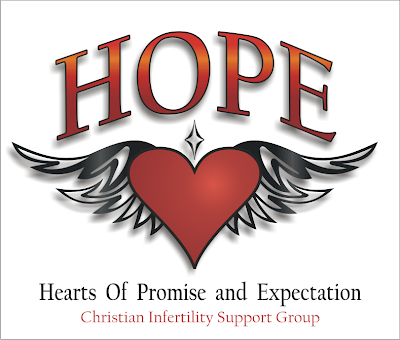 Open to women experiencing infertility, secondary infertility, multiple miscarriages and failed adoption attempts. Come and receive comfort for your broken heart, prayer to encourage you and support from others. Contact [email protected] for more info. 3700 Southwest Frwy., Houston, Tx., 713-6354154.